An Air Compressor That Won’t Settle for Second-Best! Although a compressor might seem like something that is solely aimed at professionals, there are so many applications for it in everyday life it would take me hours to name them all. If you ever need to inflate a tire, ball, do some nailing, cleaning, or screwing on or off, the job will go a lot quicker if you use an air compressor. If you like to fiddle around with cars or tend to get preoccupied with DIY projects of any kind, an air compressor I think a device like this is a necessity not a luxury. You can attach just about any power tool to it and complete other jobs like spray painting or sandblasting. With this in mind, It would be nice to have a compressor which is a jack of all trades. 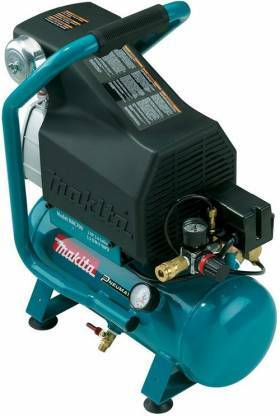 Luckily for you (and me) I have found the Makita MAC700 Big Bore Air Compressor. The unit provides a maximum pressure of 130 PSI, or 90 psi at a delivery rate of 3.3 CFM, 3.8 CFM at 40 PSI, and the capacity of the tank is 2.6 gallons. The motor is actually pretty powerful, maxing out at 2.0hp, but it is low on noise which never exceeds 80 dB since it operates at 1720 rpm. It has an oil-lubricated pump for greater lifespan, as well as a low 12 amp draw. The entire thing weighs around 52lbs. Let’s take a look at the specs in a bit more depth. The centerpiece of this device is its powerful motor which has a pump made out of cast iron with a big bore cylinder and piston, which is there to provide the absolute best in performance. In case you’re n sure let me explain what all those terms mean. The bore is the diameter of the cylinder in piston engines, and the stroke is the movement of the piston inside the cylinder. A larger bore and longer stroke means better compression, less noise emission, and a quicker recovery time. Also, the volume of air produced is significantly larger resulting in a fewer number of cycles, and protects the components from wearing out too much. I mean the reservoir, not a vehicle! Although the way this compressor is built I wouldn’t be too far off the mark if I did indeed call it a tank. The unit has a “hot dog” type tank which fulfills the demands in most cases because of its short recovery time. If the numbers 130 PSI, or 3.3 CFM at 90 PSI aren’t telling you much, let me put it this way. Power tools such as air sanders, wrenches and grinders only require pressure of 90 PSI in order to operate, so there’s plenty of reserve hidden inside the compressor. If you really need more air, you can purchase a separate tank and transfer it there. The air compressor is able to deliver power at under 80dB which is lower than your average kitchen blender. Just to give you an idea of how quiet it is, the average compressor operates at 90dB. The difference may not seem that massive, but remember an increase of just a few decibels can sometimes means double the noise. Although noise should not be the first thing you consider when getting an air compressor, it is still awesome to find one that is powerful, but can also be used inside a home, garage, or workshop without waking up the whole neighborhood! Although oil-free compressors require less maintenance, if you are doing some serious work that requires a device like this, you are better off with the oil-lubricated kind. Why? Because even though you need to maintain it which means things can get messy, having an oil-lubricated pump means longer life and more reliable operation. Oil-free pumps have a tendency to overheat, especially when extensive operation is involved, so this “little feature” solves that problem. When it comes to maintenance, the infamously messy process is barely an inconvenience since the oil tanks comes with a sight glass which lets you know if there’s still any oil in the compressor. All you have to do is drain the oil by unplugging the oil drain plug and then put new oil in which, incidentally comes with the compressor. Here, you need to look at two things: Size and weight. The unit measures 18x10x22 inches which makes it compact enough to move. The weight is around 52lbs so while not exactly small, it still allows for a good degree of portability. After all it is an air compressor, not a pillow! In fact, all that weight is just there to make it more stable. As for putting it away or transporting it to another location, you won’t have any trouble tucking it away in your garage, or basement as well as the trunk of your car. The benefits of a low amp draw are numerous. For example, if you are using a compressor at a construction site, tripped breakers and voltage drops can cause motor failure. Even using a simple extension cord can lead to tripping breakers. This interrupts your work, wastes time, and damages the motor. Although I checked the reviews for this product which were stellar, I had already made up my mind about it. It is simply brilliant. It will successfully face just about anything you throw at it, and it turn’s in some impressive performance figures. It’s extremely robust, but you don’t lose any portability because of it. If you are keen on spending your money on a compressor that is never anything less than superior, I don’t think you’ll be making a mistake taking a close look on Amazon.